Good hygiene in the kitchen can prevent the spread of infections and germs. Did you know that men are the worst offenders when it comes to basic hygiene? The Hygiene Council found that many people are not washing their hands before they prepare food, and almost 25% of the population handles food after touching their pets, without disinfecting first. The figures are startling but as homeowners, we can make a difference in our home. It is our responsibility and the first point of call is the kitchen. We can have a nice, clean cooking area with some simple techniques and tips. But what about the hard to reach places? There are several nooks and crannies in the kitchen where dirt can congregate. However, read on to find out how to combat those difficult hotspots. The oven can amass a lot of grime over time and it can prove difficult to clean thoroughly. Food waste can accumulate right at the back, as well as on the upper top surface. You don’t need to spend hours trying to keep the appliance looking new. Baking soda is a cheap cleaning agent and all you need to do is mix it with warm water; or alternatively, choose a range cooker with stay-clean liners which help to minimise maintenance time. Drawers can get very dusty and dirty with food crumbs. If you reach into your drawer for some clean cutlery and find that it needs washing again before use, it is time to clean your drawers. Empty it completely of all the contents, use the nozzle on your vacuum to get all of the crumbs, and then use a warm dishcloth to wipe all the surfaces. Can’t get right into the corners? Use an old toothbrush! If you really want to go the extra mile, take the drawers off their runners and soak the runners in hot soapy water. It will definitely get rid of any stiffness or creaks. 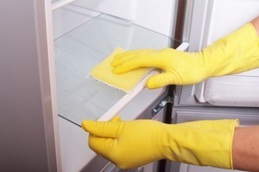 The fridge can get dirty with split food and liquids but cleaning it is fairly easy. Simply empty the appliance of all its contents and pull each individual rack out. Wash with warm soapy water, and take the glass protectors off for an extra good clean. As well as inside the fridge, don’t forget to clean the fridge’s vent which can get clogged up with dust. Once a year, pull the appliance out from the wall, unplug it from the mains and wipe the exterior surfaces down. The fridge handle can get full of bacteria, so don’t forget to clean the handles as well as the area in which the handle joins the door. So there you have it; three tough spots in the kitchen that can easily be tackled with a little bit of know-how. Make sure your kitchen is pristine this year, as after all, it is one of the most important rooms in the house. 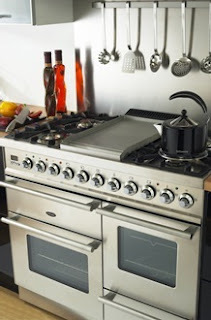 This article was written by Lauren Grice on behalf of Britannia Living, the leading experts in premium, state-of-the-art range cookers.